TRAILHEAD ACCESS: Take 1-90 Exit 80 and go north through Roslyn, then north on Highway 903 to Lake Cle Elum and north along the lake to FS Road 46. Head northwest on Road 46 about 2 miles to the trailhead. PARKING AND FACILITIES: There is roadside parking for 6 vehicles. No facilities. 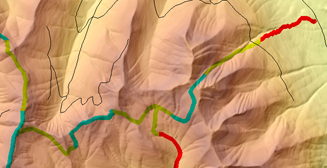 TRAIL: Leaving the road, tile trait climbs steeply with numerous short switchbacks. From the trailhead to Little Joe Lake, the trail is closed to stock due to steep, rough conditions. It crosses a logging road and continues climbing steeply into a high basin, passing near an old mine. It is difficult to find in an avalanche area, and tops out at a timbered saddle. From here a short trail goes north to an old lookout site. The main trail continues south along the ridge for a short distance and then heads off the ridge through an open area, switchbacking downhill through small timber to Little Joe Lake and the junction with Little Joe Lake Trail #1330.1. The 1330.1 trail is hiker-only and heads downhill 1.3 miles to its trailhead on FS Road 4312-123 along Thorp Creek. From Little Joe Lake, the 1330 trail is open to stock to Kachess Ridge Trail #1315. It goes past the outlet of the lake, climbs to a minor ridge, descends into a small basin, then climbs in a westerly direction to its end at Kachess Ridge Trail #1315. This trail is usually easy to find where it is in the timber, and sometimes difficult to find in open areas. SETTING: Valley bottom, open hillsides, ridgetops, lake, old-growth timber, meadows, subalpine zone. OPPORTUNITIES: Hiking, scenery, wildlife, photography, fishing, pathfind­ing, hunting, camping. 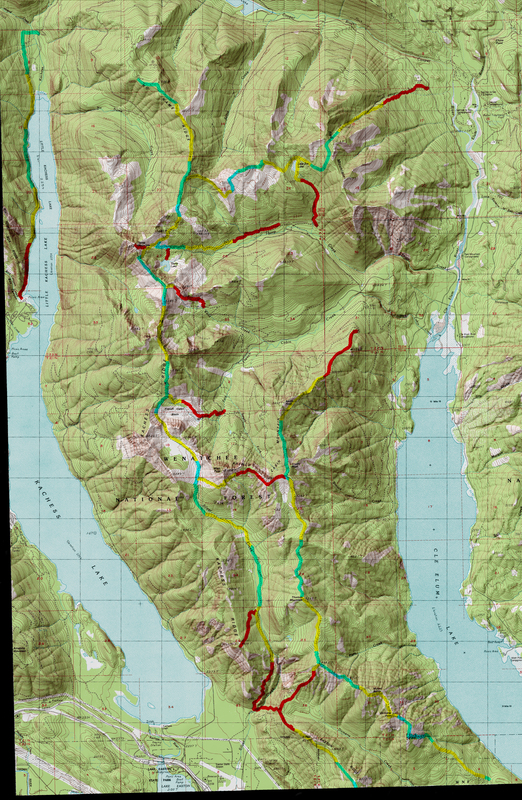 OTHER TRAILS: Little Joe Lake #1330.1, Kachess Ridge #1315.